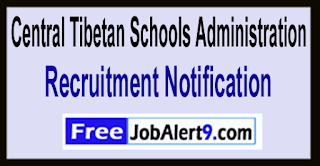 CTSA (Central Tibetan Schools Administration) Has Released Recruitment Notification For 67 Teacher, Librarian Posts. All Eligible And Interested Candidates Can Apply Offline. Further Detailed Information Regarding Educational Qualifications, Age Limit, Selection Procedure, Exam Pattern, Syllabus for CTSA (Central Tibetan Schools Administration) Recruitment 2017 - 67 Teacher, Librarian Post is mentioned below. Age Limit - Candidates age should be between 30 to 45 -Years (Post 10,19).Candidates upper age limit should not Exceed 45 - Years (Post 1,2), 40 -Years (Post 3-9), 35 -Years (Post 11-16), 30- Years (Post 17,18). Selection Process - All Eligible Candidates will Be Selected Based on Their Performance In Written Exam / Inter-view . Pay Scale - Rs. 15,600 - 39,100/- With 7600/5400/- Grade Pay (Post 1,2), Rs. 9300 - 34,800/- With 4200/4800/- Grade Pay (Post 3-19) . How To Apply - All Eligible & Interested candidates Can Download application Form through official web-site (http://ctsa.nic.in). After Filling The application form, candidate must send by hard copies of application a long with relevant testimonials (Mentioned In Detailed Advertisement) to the following Address before / (2nd June 2017). Address -Director, Central Tibetan Schools Administration, ESS ESS PLAZA, Community Centre, Sector-3, Kohini, Delhi -110085 . The Last date For Acceptance of Application Forms - 02-06-2017. Click Here For CTSA Recruitment 2017 Detailed Advertisement. 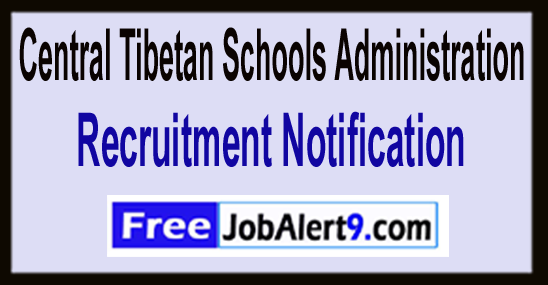 CTSA (Central Tibetan Schools Administration) Has Released Recruitment Notification For 38 Clerk, Assistant Posts. All Eligible And Interested Candidates Can Apply Offline. Further Detailed Information Regarding Educational Qualifications, Age Limit, Selection Procedure, Exam Pattern, Syllabus for CTSA (Central Tibetan Schools Administration) Recruitment 2017 - 38 Clerk, Assistant Post is mentioned below. Age Limit - Candidates age should be between 18 to 27 -Years (Post 8).Candidates upper age limit should not Exceed 56 -Years (Post 1,2), 40 -Years (Post 3), 35 -Years (Post 4,5,7,10), 27 -Years (Post 6,13,14), 30 -Years (Post 9), 45 -Years (Post 11,12). Selection Process - All Eligible Candidates will Be Selected Based on Their Performance In Test or Inter-view . Pay Scale - Rs. 15,600 - 39,100/- With 6600/- Grade Pay (Post 1), Rs. 9300 - 34,800/- With 4600/- Grade Pay (Post 2-5), Rs. 5200 - 20,200/- With 2400/- Grade Pay (Post 6-14) . How To Apply - All Eligible & Interested candidates Can Download application Form through official web-site (http://ctsa.nic.in). After Filling The application form, candidate must send by hard copies of application a long with relevant testimonials (Mentioned In Detailed Advertisement) to the following Address before/ (19th May 2017). Address -Director, Central Tibetan Schools Administration, ESS PLAZA, Community Centre, Sector-3, Rohini, Delhi -110085 . Last Date to Submit Hard Copy of Application Form Is - 19-05-2017. Click Here For CTSA Recruitment 2017 Detailed Advertisement & Application Form.